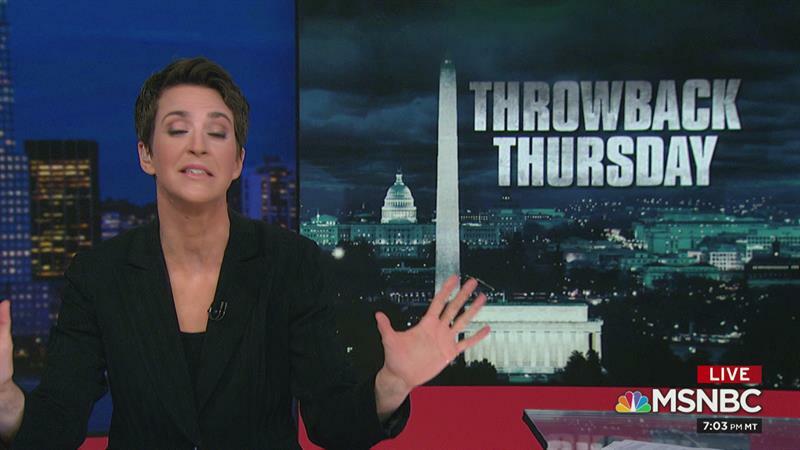 Watch the full episode of Tuesday night's The Rachel Maddow Show. * Afghanistan: "A car bomb outside of Afghanistan's Bagram Airfield on Monday killed three U.S. service members and a contractor, and wounded three other American service members, officials said. The injured personnel were evacuated and receiving medical care, the NATO-led Resolute Support mission said in a statement." * An unprecedented move: "President Donald Trump says the U.S. has designated Iran's Revolutionary Guard a 'foreign terrorist organization' as part of an effort to increase international pressure on the country. It's an unprecedented move because the U.S. has never before used the designation for an entire foreign government entity." * Louisiana: "Three historically black churches have burned in less than two weeks in one south Louisiana parish, where officials said they had found 'suspicious elements' in each case. The officials have not ruled out the possibility of arson, or the possibility that the fires are related." * Homeland Security Secretary Kirstjen Nielsen wanted to put out a resignation letter before Donald Trump tweeted about her departure. He didn't care. * Israeli elections are tomorrow: "Struggling to rally right-wing voters before Tuesday's elections, Prime Minister Benjamin Netanyahu said Saturday that he would start to extend Israeli sovereignty over the West Bank if given a fourth consecutive term." * Trump went after her by name the next day: "A New York State man was arrested and charged Friday for threatening to kill Minnesota congresswoman Ilhan Omar, the U.S. attorney's office said in a statement." * He's quite a nominee: "One of President Donald Trump's new picks to serve on the Federal Reserve Board, Trumponomics author Stephen Moore, was found to be in contempt of court in 2012 for failing to pay more than $300,000 in alimony and child support." It was two years ago this month when Donald Trump appointed Randolph "Tex" Alles to be the new director of the U.S. Secret Service -- the first Secret Service chief in a century to lead the department without ever having been part of it. Now, as the president shakes up his domestic-security team, Alles is out, too. Randolph Alles, the director of the U.S. Secret Service, is leaving his position, NBC News confirmed on Monday. Alles, a retired Marine Corps major general who was appointed two years ago, reports to the head of the Department of Homeland Security, Kirstjen Nielsen, who resigned under pressure on Sunday night and is leaving the post on Wednesday. According to CNN's report, Trump -- who loves to fire people, so long as he's not the one doing the firing -- "instructed" acting White House Chief of Staff Mick Mulvaney to fire Alles. Like Kirstjen Nielsen, Alles was reportedly elevated to this post at the encouragement of John Kelly, the former White House chief of staff. With Kelly out, the Secret Service chief apparently lacked the allies he needed to remain at his post. But it's the larger context that's probably the most jarring. In the coming days, we'll see a Department of Homeland Security without a Senate-confirmed secretary. According to the DHS leadership page, there will also be no Senate-confirmed deputy secretary, no Senate-confirmed Secret Service director, no Senate-confirmed FEMA chief, no Senate-confirmed head of ICE, and no Senate-confirmed DHS inspector general. Once Kevin McAleenan, the current Customs and Border Protection commissioner, starts filling in for Nielsen as the acting DHS chief, his office won't have a Senate-confirmed commissioner, either. It may be tempting to think the Donald Trump's "zero tolerance" policy, which led to the separation of many migrant families, is a tragedy from our recent past. The president and his team implemented a cruel approach; there was a public backlash; the White House scaled back its policy, and a federal court ordered an end to the brutal fiasco. But as regular readers know, the tragedy is ongoing. Earlier this year, the Department of Health and Human Services' inspector general's office reported that the administration separated more children from their parents than we previously knew, and it struggled to determine whether the families had been reunited. In a separate court filing late last week, officials said identifying the children taken from their families could take two years. 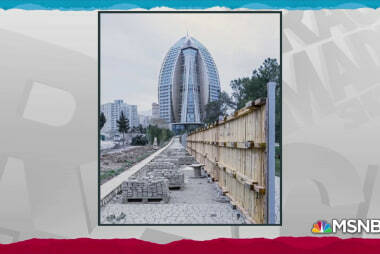 It's against this backdrop that NBC News reported this morning that Donald Trump wants his "zero tolerance" campaign reinstated. President Donald Trump has for months urged his administration to reinstate large-scale separation of migrant families crossing the border, according to three U.S. officials with knowledge of meetings at the White House. Trump's outgoing Homeland Security secretary, Kirstjen Nielsen, resisted -- setting her at odds with the president. Imagine watching the family-separation crisis unfold and concluding that the United States needs more of it. * At an event over the weekend, former President Barack Obama expressed some concern about the "rigidity" of some in his party's base, whom he believes targets Democrats unnecessarily for "straying from purity on the issues." * The Associated Press reported over the weekend on "a persistent group" of Sen. Bernie Sanders' (I-Vt.) supporters, who not only believe the process was deliberately stacked against him in 2016, but who are also threatening not to support the Democratic ticket in 2020 unless the Vermont senator is the nominee. * Sen. Elizabeth Warren (D-Mass.) is unveiling a detailed new housing policy today, which she summarized in an op-ed for the Reno Gazette Journal. * Sen. Cory Booker (D-N.J.) became the latest Democratic presidential hopeful to release his fundraising tallies from the first quarter, announcing yesterday that his campaign raised $5.1 million in the first three months of the year. That's short of the kind of numbers we've seen from some of the senator's rivals. * A new survey from Emerson Polling found Bernie Sanders leading the Democratic field in Massachusetts with 26%, followed by former Vice President Joe Biden with 23%. Elizabeth Warren was third in her own home state with 14%, which seems problematic. * Rep. Tim Ryan (D-Ohio) formally launched his presidential campaign over the weekend with a rally in Youngstown. * The Republican Senate primary in Alabama is likely to be a very crowded one, as evidenced by former Auburn football coach Tommy Tuberville throwing his hat into the ring over the weekend. The GOP nominee will face incumbent Sen. Doug Jones (D) in 2020. A variety of factors likely contributed to Donald Trump forcing Kirstjen Nielsen from her post as Homeland Security secretary, but her acknowledgement of legal constraints clearly didn't help. The New York Times noted this amazing behind-the-scenes anecdote in which the president urged the cabinet secretary to take actions she could not legally implement. The president berated Ms. Nielsen regularly, calling her at home early in the mornings to demand that she take action to stop migrants from entering the country, including doing things that were clearly illegal, like blocking all migrants from seeking asylum. She repeatedly noted the limitations imposed on her department by federal laws, court settlements and international obligations. Those responses only infuriated Mr. Trump further. At face value, it's obviously unsettling dynamic: an American president with authoritarian tendencies pushed a top official to implement illegal policies. Trump had a vision for the kind of border agenda he'd like to see implemented, and he grew "infuriated" when told that his administration had to act within the confines of the law. In the Republican's mind, legal limits are annoyances and impediments to "tough" policies that the amateur president prefers. But just as important is the frequency with which we're confronted with this dynamic. In December, for example, former Secretary of State Rex Tillerson spoke at event in Houston and described the kind of instructions he'd receive from Trump. "So often, the president would say, 'Here's what I want to do and here's how I want to do it,'" Tillerson explained. "And I would have to say to him, 'Mr. President I understand what you want to do but you can't do it that way. It violates the law.'" Or put another way, we now know of more than one cabinet secretary from the Trump administration who was asked to pursue policies that conflict with American laws. Now that Donald Trump has publicly confirmed that he's eyeing Herman Cain for a position on the Federal Reserve's Board of Governors, the Georgia Republican is starting to reflect on his upcoming confirmation hearings. Cain apparently wants the job for which he has no meaningful qualifications, but he isn't sure he'll get it. "It's an honor to be considered, whether or not I will make it through this process -- time will tell," Cain said. "Would I be disappointed if I don't make it through this process? No." He'd have lots of company. When Trump chose Republican pundit Stephen Moore to serve on the Federal Reserve board, the president had obviously made a uniquely ridiculous choice. For a variety of reasons, Cain might actually be worse. Among the most glaring problems with the failed presidential candidate joining the Fed board is that Cain doesn't appear to understand economic policy at the most basic level. A Washington Post analysis described his views on monetary policy and financial regulation as "quack-tastic." That's true, of course, but let's not forget that it's an approach Trump seems to have stumbled onto quite recently. Two days after Attorney General Bill Barr issued his characterizations of Special Counsel Robert Mueller's report, Donald Trump was eager to exaggerate the findings. "The Mueller report was great," the president told reporters two weeks ago, referring to a document he has not read. "It could not have been better." 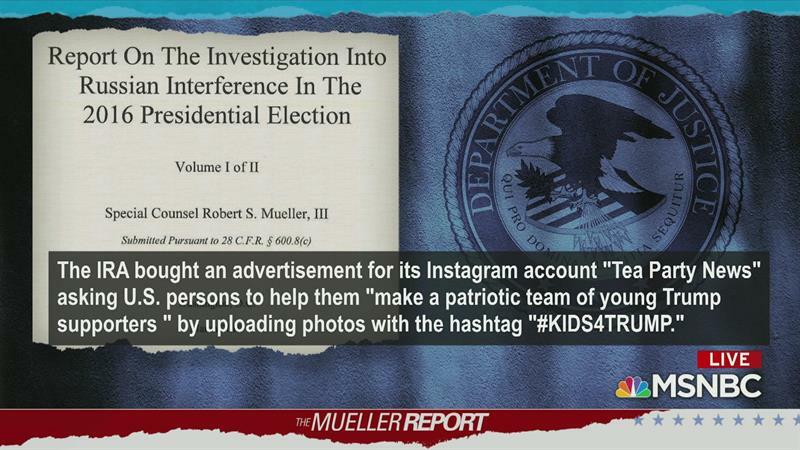 It was part of an aggressive White House public-relations offensive, intended to convince the public that the special counsel had fully exonerated Trump and his team, while destroying the credibility of anyone who dared take the Russia scandal seriously. That confidence has started to evaporate. The president who fully endorsed disclosing the Mueller report, for example, recently changed his mind. White House officials have started to signal their concerns that their colleagues have oversold the special counsel's actual findings. And 12 days after Trump said the Mueller report "could not have been better," a high-profile member of the president's legal defense team suggested that the still-hidden document may raise at least a little trouble for his boss. President Donald Trump's personal attorney Rudy Giuliani said Sunday that he was "confident" there would "be no evidence of anything really bad" in special counsel Robert Mueller's final report. 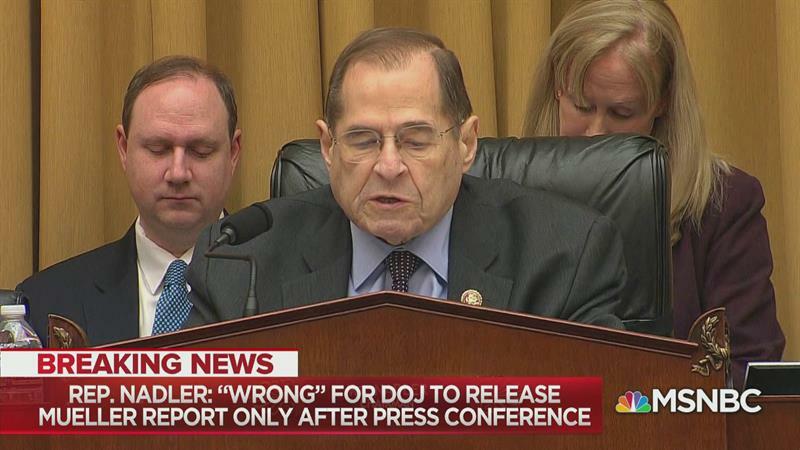 But, in an interview with CBS News' Margaret Brennan, Giuliani stopped short of saying there would be no evidence of obstruction of justice in the report, a question that Attorney General William Barr's four-page summary of the expansive document left open. When the host asked, "Are you confident there will be no evidence of obstruction of justice in these 400 pages?" Giuliani replied that he has reason to be confident that there will be "no evidence of anything really bad." That would appear to leave open the possibility of evidence that's kinda sorta bad. Giuliani than tried to change the subject to conspiracy theories involving Roger Stone's arrest. Why did Trump dump his own nominee to lead ICE? At a White House event last summer to honor ICE and Customs and Border Protection officials, Donald Trump took a moment to single out Ron Vitiello, the acting ICE director, for praise. The president said Vitiello was doing a "great job." Evidently, that positive impression did not last. President Donald Trump has withdrawn his nomination of Ron Vitiello to lead U.S. Immigration and Customs Enforcement, choosing instead to go with a nominee who would chart the critical immigration agency "in a tougher direction." The decision about Vitiello was unexpected, and confusion surrounded the circumstances. How much confusion? On Friday, when the president was headed to California for a border event, Vitiello was supposed to join Trump -- but he was uninvited at the last minute. The Washington Post added that the acting ICE chief was "blindsided" by the move, and he wasn't alone: "The decision to ditch Vitiello stupefied Homeland Security officials and lawmakers. Some ICE officials and Senate aides were so taken aback, they told reporters they thought the White House had made a clerical error." Many in the Department of Homeland Security were "baffled" by the developments. Let's also not overlook the context in which this unfolded: Trump believes there's a dangerous crisis underway at the country's southern border. It's against this backdrop that the president decided to scrap the nomination of his own handpicked ICE director, apparently without warning, and two days later, he accepted Homeland Security Secretary Kirstjen Nielsen's resignation. So, what in the world happened? As part of an unfortunate and misleading photo-op, Donald Trump traveled to southern California on Friday to highlight some replacement border fencing that his administration had very little to do with. During the trip, the president pushed a new talking point: the United States cannot accommodate any additional immigrants because the country is "full." "The system is full. We can't take you anymore," Trump said at a roundtable event with law enforcement officials and local leaders at a border patrol station in Calexico. "Our country is full...Turn around." He added, "When it's full, there's nothing you can do. You have to say, 'I'm sorry, we can't take you.'" A day later, speaking to the Republican Jewish Coalition, the Republican repeated the line, telling supporters, "We're full. Our system is full, our country is full, can't come in." To the extent that reality has any meaning in the debate, the United States is not, in fact, "full," and we have room for a growing population. It's not as if public officials are telling American women who are pregnant, "I hate to break this to you, but our country simply can't accommodate any additional human beings, so I hope you're prepared to relocate to a different country." But that's only a small part of the bigger picture. Rep. Pramila Jayapal (D-Wash.) said on Friday, "It's just a ridiculous statement. We have agriculture industries across the country that desperately need workers. We have construction industries in California and in other places that desperately need workers, and immigration has always been not just a question of immigration policy, but who we are as a country." One of the things that makes Jayapal's response so compelling is that, on multiple occasions, Trump has slipped up and made similar comments. Why would Trump agree to a meeting with Steve Wynn? It was early last year when billionaire casino mogul Steve Wynn, facing sexual misconduct allegations, resigned as the finance chairman of the Republican National Committee. The story has since become even more serious: an investigatory report later painted an ugly portrait of an executive accused of "sexually assaulting or harassing" many women who worked for him. Just last week, state regulators concluded that Wynn's company "ran a longstanding, sophisticated cover-up to protect founder Steve Wynn from allegations by employees that he had engaged in sexual misconduct against them." By one account, Wynn greeted Trump on the airport tarmac on Saturday. It's not clear, at least not yet, what the two discussed. But the larger question is why a sitting president would participate in such a meeting at all. In late October 2012, just days ahead of Barack Obama's re-election, Donald Trump published a tweet directed at the sitting Democratic president. "Why does Obama believe he shouldn't comply with record releases that his predecessors did of their own volition?" the Republican complained. "Hiding something?" Four-and-a-half years later, I'm still a little fuzzy on what it was, exactly, Trump thought Obama was hiding, but when it comes to complying with record releases that his predecessors did of their own volition, the current president and his team have found themselves in a difficult spot. President Trump's acting chief of staff said Sunday that Democrats' efforts to see Trump's tax returns will "never" be successful, and "nor should they." "That's an issue that was already litigated during the election," [Mick Mulvaney said on Fox News]. "Voters knew the president could have given his tax returns. They knew that he didn't, and they elected him anyway." After all years of questions about Trump's insistence on secrecy, it's curious that top members of the president's team can't think of better arguments. In this case, if the will of the voters is paramount, it's worth noting that Trump actually lost the popular vote -- it was the electoral college, not voters, who put the Republican in power. What's more, two years later, voters easily elected a House Democratic majority, after Dems ran on a platform emphasizing oversight. Let's also not forget that the importance of Trump's returns has grown more acute in light of revelations that came to the fore after the 2016 election. But of particular interest was Mulvaney's use of the word "never." Two years before Trump launched his candidacy, he vowed, "If I decide to run for office, I'll produce my tax returns, absolutely." In the years that followed, Trump routinely promised to disclose the materials once an IRS audit -- that may or may not have been real -- was complete. But now those promises have been replaced with a categorical statement that the president's tax returns -- documents that every major-party nominee has voluntarily disclosed since Watergate -- will be kept secret permanently. According to Donald Trump, there's an ongoing national emergency along the United States' southern border. 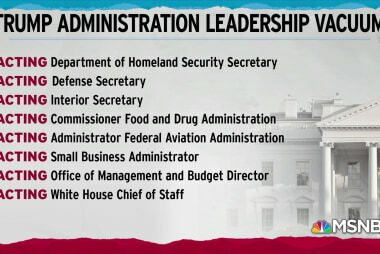 As of yesterday, the president is comfortable trying to address this "crisis" without his Homeland Security secretary. Homeland Security Secretary Kirstjen Nielsen is leaving her position, President Donald Trump said on Twitter Sunday. Kevin McAleenan, commissioner of Customs and Border Protection, will become acting secretary pending confirmation of Nielsen's successor, Trump said. Nielsen was asked to the White House after Trump expressed frustrations, including over not being able to seal the border, during the week, according to a senior U.S. official. It was up to her to convince him to keep her, the official added. Evidently, the secretary proved unpersuasive. The DHS chief said she'll stay on through Wednesday "to assist with an orderly transition," which seemed like a curious thing to say. The Department of Homeland Security is a massive federal bureaucracy, and a smooth leadership transition -- to an acting director whose appointment is already drawing legal questions -- takes more than 72 hours. It was also of interest that Nielsen's resignation letter made no reference to Donald Trump. James Mattis' letter, as he departed the Pentagon, didn't either. It's almost as if top officials on this president's team weren't especially impressed with him and take no pride in having served on his cabinet. These developments do not entirely come out of nowhere. About a year ago, Trump scolded Nielsen in front of the rest of the White House cabinet, reportedly for half an hour, prompting her to draft a resignation letter that was never submitted. There were multiple reports of her looming ouster in the fall, and after her greatest champion -- former White House Chief of Staff John Kelly -- left the West Wing, her days in the administration appeared numbered.